Improve your golf swing tempo, timing, and grip position indoors or out with the SKLZ Rick Smith Tempo and Grip Trainer. Removable weights to simulate both woods and irons help you warm-up, stretch out, and build golf-specific muscles without having to pull out your clubs. 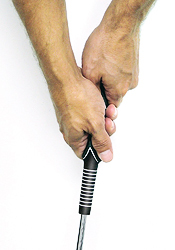 The molded training grip provides ideal hand placement and position to produce the correct golf grip, while two weight adjustments allow you to simulate iron and wood practice. The Grip Trainer is for right-handed golfers only.